Huge Savings Item! Free Shipping Included! Save 14% on the WHITSUNDAY Collapsible Folding Garden Outdoor Park Utility 30'' Picnic Wagon 1 Year Warranty (Amazon Green) by WHITSUNDAY at The Net Stores Network. Hurry! Limited time offer. Offer valid only while supplies last. Effortlessly haul your gear or groceries with the Whitsunday Folding Utility Wagon. The Whitsunday folds and opens in seconds with an easy operation! Effortlessly haul your gear or groceries with the Whitsunday Folding Utility Wagon. The Whitsunday folds and opens in seconds with an easy operation! It is designed to be lightweight, yet durable with a maximum load capacity of 150 lbs. and contains more than 4.5 cubic feet of carrying capacity. 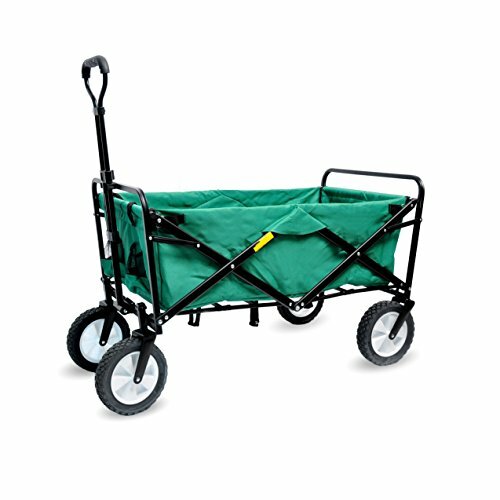 This wagon is perfect for trips to the market, park, beach, sporting events, camping, and much more! The Whitsunday folds easily into its own carrying bag for compact storage. We are a California-based company and offers local customer support and service as well. HAULING POWER - Internal dimensions 34"(L) X 20"(W) X 11"(D) over 4.5 cubic feet of storage space! LOAD CAPACITY - Can withstand up to 150 lbs of load! Extra thick steel frame to ensure sturdiness. Durable canvas fabric on the wagon can be removed for cleaning. EASY FOLDING - Patented design to ensure easy folding and unfolding. Once collapsed the wagon is super compact (27"X20"X7") and easily fits into any car trunk or closet. Carrying bag is included for transport and storage. ADJUSTABLE HANDLE AND 360 DEGREE WHEELS - The pulling handle is telescopic with adjustable length of 20" to 30" for a comfortable height. Heavy duty and durable rubber wheels can rotate 360 degrees for easy maneuvering. BUY WITH CONFIDENCE - One year warranty. US based customer support. If you have any questions about this product by WHITSUNDAY, contact us by completing and submitting the form below. If you are looking for a specif part number, please include it with your message.